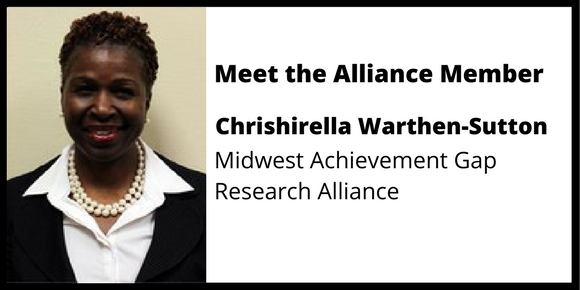 MAGRA member Chrishirella Warthen-Sutton, Ph.D., is the manager of the Office of Family and Community Engagement for the Racine Unified School District in southeastern Wisconsin. The state's fifth–largest district, Racine includes 31 schools that serve a diverse population of 19,455 students. Working across this large district, Warthen-Sutton designs, directs, and evaluates programs and services to promote year–round strategic engagement of families and communities. When asked why she joined MAGRA, Dr. Warthen-Sutton said she feels a sense of urgency to develop ideas for narrowing the Black–White gap in education access and opportunity in Wisconsin. She cites the severity of the gap and the many challenges facing the state’s Black students. "The soaring unemployment rate, marginal career and college readiness, health care disparities, and unprecedented incarceration rates continue to plague Wisconsin’s Black community," she explains. "The progress is bleak statewide, given the national and state measures signifying that Wisconsin is the worst state in the nation for a Black child to be educated." Through her work with MAGRA, Dr. Warthen-Sutton hopes to broaden the discourse by examining the achievement gap through the lenses of equity, social justice, and cultural competency. "The identifiable challenge is that there are many teachers who are not culturally competent," she notes. "Belief systems shape a person's worldview of others who are culturally, racially, and linguistically diverse...Cultural responsiveness has the potential to shift mindsets and influence practices that affirm and acknowledge the brilliance of Black children." In working with education–based community organizations, Dr. Warthen-Sutton has learned the power of personal stories, experiences, and perspectives to broaden people's understanding of equity and race, as well as the value of courageous conversations. "Many efforts to address Black student achievement fail due to the lack of courage to isolate and name race as a primary contributing factor," she explains. On both a professional and personal level, Dr. Warthen-Sutton hopes her involvement with the alliance will advance her capacity to consider robust ways to address the access and opportunity gap for Black students in an intentional and deliberate manner. "In order to be a champion for children, we must be accountable for the detrimental consequences of allowing them to fall through the cracks."